Holiday Systems International (HSI) provides specialized, private-branded sales and service solutions for the global vacation ownership market. Its unique products and services have provided remarkable benefits to developers, owners and HOAs throughout the full vacation ownership lifecycle. HSI is the recipient of numerous industry honors, including the prestigious Perspective Magazine Award for Best Business Product and Best Online Service. These award- winning services have generated powerful, measurable results in a number of areas including: sales, efficiency, rescission, sampler programs, lead generation, room occupancy, maintenance fee collections, member benefits, brand loyalty, and customer retention. Known for being on the cutting edge of technology, this innovative company recently unveiled exciting new enhancements to its services. Perspective spoke with the CEO of HSI, Craig Morganson about the company’s latest developments. It seems like HSI is one of the older, more established businesses in the industry. How long has HSI been in business? Over 22 years. I founded the company in 1993 to improve the service for a select group of timeshare owners.Today we service over four million private clients. Notably, our growth has been organic, driven by our internal resources, and we still remain privately held. How do you explain such a long, successful track record? Certainly hard work, integrity and transparency are central, but what’s probably most important is remaining relevant and providing measurable results. While our products/services are attractive to prospective buyers, they also deliver impressive results. Before we introduce a new product/service, we always focus heavily on measurable value and sustainability.There will always be companies out there that offer attractive bells and whistles, but when you use a calculator, the value’s not there, or when you peel back the layers, they don’t have the internal infrastructure to support the promise. Doing it right can be more expensive, but that’s the only way HSI will do it. Last time we talked, we discussed HSI’s Custom Solutions. We’re eager to see what’s new, but first remind our readers what Custom Solutions is. Custom Solutions covers a long list of products/services that solve problems, enhance performance and impact our partner’s bottom line, with customizations that enable seamless integration.This includes member benefits, sales tools, sampler programs, premiums, lead generation, occupancy solutions, maintenance fee performance, technology and more. Custom Solutions leverages our core competencies and our massive in-house infrastructure, which provides our partners with reliable, sustainable and measurable value. So what are the HSI core competencies you’ve referenced? The three most relevant are technology, travel aggregation and private-client services. Our products/services are all supported internally, so we’re able to offer our partners easy integration options and a responsiveness that meets their needs. Some of our partners come to us with nothing more than dreams of new technology features, benefit concepts, sales tools, etc., which we can take from concept to monetization quickly, reliably and affordably. Why invest millions of dollars and years of development time to create something from scratch when a strategic alliance with HSI can provide a private-branded, award-winning system quickly, reliably and affordably? 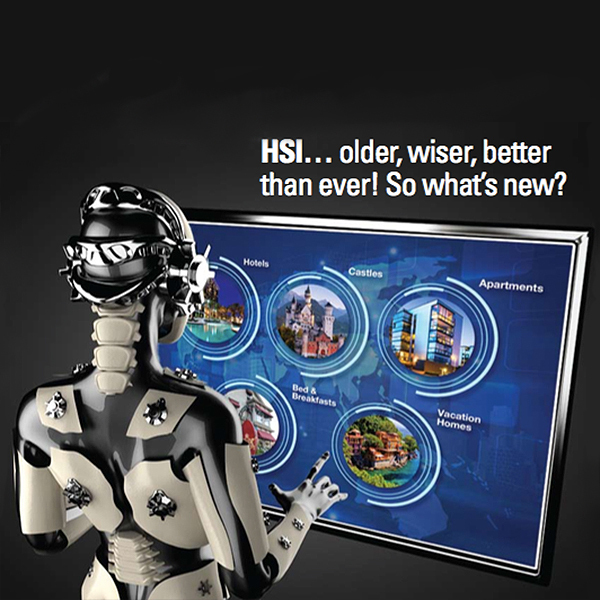 Whether it’s a new loyalty program, a new sales dashboard, an online booking system, a new user interface, an API system to interface with room distribution channels, etc., HSI partners enjoy the benefit of a world-class technology team that is eager to help. Tell me about your newly released Hotel Super SearchTM. I like the way that sounds! What is it? The Hotel Super Search is an exciting enhancement to an already great system. One of our existing Custom Solutions includes white-labeled, award-winning hotel booking systems for our partners. When members book, they receive the guaranteed lowest rates, plus we also pay commissions to our partner. Our hotel system was already the best out there, with over 700,000 3-5 stars hotels in over 180 countries and in 7 languages.The Hotel Super Search adds even more by adding new types of accommodations, new search options and new search result filters online. Now, in addition to online hotels, members can search & book castles, bed & breakfasts, apartments, vacation homes, and more.The accolades are rolling in from both our partners and members. It shows great at the point of sale, it works great for members and bookings are up. Hotels, bed & breakfasts, castles, apartments and vacation homes are a lot of different types of accommodations.What other accommodations are remaining? That’s a lot for one system, that’s why we call it the “Hotel Super Search”, but of course that’s not all we offer. Our travel benefits also include resort weeks, custom vacations, tour packages, cruises, sports travel packages, destination activities, and much more, which are all handled through our other proprietary systems. I would add that we also offer the highest quality, greatest volume, best pricing and commissions to our partners on most of those options as well. When it comes to resort weeks, resort inventory is offered and reserved consistent with the properties’ desired distribution, and our partner’s strategy. 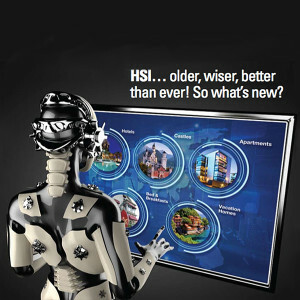 What else is new with HSI? We recently launched several new lead generation tools, premiums and FDIs (First Day Incentives). We focus on gifts that provide high value, low cost, zero breakage and easy redemption. We call this the VCBR factor (Value, Cost, Breakage, Redemption factor).The industry seems to have a shortage of gifts that provide all four. Usually, when you find a low cost gift, it has no value and/or high breakage. Our new products include our Resort Advantage Card®, our Hotel Savings Card® and several new FDIs, including our “You’re Invited” certificate, our “Live the Stories” certificates, among others. Can you give us a brief description of these? The Resort Advantage Card® is a gift card providing $200 off select resort vacations, the Hotel Savings Card® provides $50 off over 700,000 hotels and can now be private- branded for our partners, and our FDIs offer everything from 7-night-stays at luxury resort properties to stay/play golf packages. All of these gifts are producing great results as lead generation tools, premiums, closing tools and to re-engage old customers. I know HSI also offers some unique timeshare services. Can you update us on those services? One of our most popular is our maintenance fee payment system.This service is exclusive to HSI and continues to prove invaluable to our partners and members. We provide this service in a variety of ways, depending on our partner’s needs, including loyalty credits, points redemption options, Cash Exchange®, Advantage Credits®, among others. Last time we spoke we were at $40 Million paid and 1,500 properties/HOAs benefiting. Now we’ve surpassed $45 million in maintenance fees paid, benefiting over 1,600 vacation ownership properties and HOAs.That’s an increase of $5 million in less than one year and another 100 properties/HOAs. While companies have attempted to copy this benefit, HSI remains the only company to actually pay cash to members related to their maintenance fees. It’s hard to argue with $45 million in cash payments. This benefit not only impacts maintenance fee receivables, but it also has a significant positive impact on sales, upgrades, customer satisfaction and brand loyalty (to our partner’s brand). Not to mention how it keeps our partner’s properties off the resale listings. For select properties we can even guarantee a 100% maintenance fee collection rate. Those maintenance fee payment numbers are impressive. It’s great to see honest solutions. What are some of your other unique timeshare services? We place a lot of emphasis on adding flexibility and value to the vacation ownership experience. It’s always about measurable advantages over other services and general public options. Examples of this include our award-winning Advantage Program®, GlobalTravel Benefits®, among others, which include a wide range of customized services that produce remarkable results.These services include everything developers, marketing companies and HOAs need to appropriately engage and monetize their members.Through these systems members enjoy exclusive benefits, including the ability to convert their vacation ownerships to credits, and then redeem those credits for best-price travel and/or even cash. Or enjoy additional point system redemption options with cash options. And of course best-price travel offers, maintenance fee relief options, and much more.These benefits, among others, enhance the perceived and actual value proposition in a meaningful way, increase sales, improve efficiency, reduce delinquencies and produce additional revenue for our partners through new revenue sharing opportunities. How has HSI been expanding and what are some of your other services? We continue to expand and provide innovative products/services for every aspect of the vacation ownership industry. Markedly, our lodging management systems have also become very popular. In fact, we now manage entire room inventory systems for select partners and liaison between them and their room distribution channels, in-and-out of the timeshare industry.This helps reduce our partner’s overhead by channeling all relationships through one system while maintaining complete control. These systems cover the full spectrum of room marketing needs, from extranet to sophisticated API feeds, online and in- house reservation systems, and more. In closing, is there anything you would like to add about HSI? HSI was founded with a philosophy of generosity, transparency and sustainability, which continues today, over 22 years later. HSI enables its partners to establish their independent success and sustain it. HSI’s core staff includes a depth of long-term employees that are proud to work at HSI because of the measurable value we provide and the incredibly innovative ways we help the industry. HSI has had, and continues to have, a very positive impact on sales, service, customer satisfaction and receivables. I’m proud of HSI, its staff, its products/services and its impact on the industry. Developers and marketing companies, regardless of their size or expertise, should contact HSI and learn how we can help.